The VeloSolex powered bicycle was introduced in 1946. By the time the iconic French design ceased production in 1988, over 8 million had been sold. It lived on for almost two decades as a licensed design produced in China and Hungary. Production returned to France in 2005, and the S4800 has been marketed by VeloSolex America in North Bergen, NJ. for several years. The bike is the essence of simplicity - a 49cc two stroke engine sits over the front wheel, putting out a whopping 0.80 bhp at 2200 rpm. As you might guess, it's economical - the 1.4 L tank gives you a range of 60 miles, although you'll have to pedal to get the machine up steeper hills. The maximum speed is pre-set to 20 mph, so don't expect to break any land speed records. Accessories include a $100 catalytic converter to reduce the cloud of oil-infused 2-stroke exhaust, a $25 horn, saddle bags ($45 each) and a $55 digital speedometer. Best of all, custom colors are available for only $100 extra, so owning a blinding safety orange S4800 is a distinct possibility... if you dare. If the thought of a 2-stroke motor running on dinosaur grease sends you into a fit of envirorage, check out the futuristic e-Solex. This clever electric update is available from Solex in France with a dramatic redesign by Pininfarina. A rear-mounted 400W hub motor is capable of propelling the bike at up to 20 mph with a range of approximately 25 miles, and they thoughtfully retained the pedals in case you feel like working up an environmentally friendly sweat. The FreeRadical bolts to the rear of your current bicycle and lets you to carry up to 200 lbs of cargo, equipment or passengers. It extends the frame 17 inches, weighs a mere 5 lbs and fits most 26" diamond frame bikes. On sale until the end of the month for $399, direct from XtraCycle. Madina at Ural-IMZ just gave us a shout about the new Ural-T. They've managed to shave the price of their famous BMW R71-inspired machine down to a very reasonable $9,999. Truth be told, I like the spartan look of the basic black Ural-T better than its pricier siblings. The machine shares the same mechanical underpinnings as the rest of the Ural lineup, but does away with niceties such as the sidecar windscreen and spare tire. The Bullet G5 is a modern, fuel-injected, low maintenance version of the world famous 1955 Royal Enfield Bullet. This hand-painted bike oozes vintage charm, but the modern 499cc single cylinder 4-stroke engine promises excellent mileage, simplified maintenance and higher cruising speeds. In addition to the new fuel injected powerplant, the updated bike offers improved suspension and handling and an estimated 85 mpg fuel economy. It features a 2 year unlimited mileage warranty in the USA. Not bad for $5995. Nate Dahl writes, "The Honda Super Cub may be the most-produced motorcycle in the world, having sold more than 60 million since it was introduced in 1958, but in spite of the fact that it's still going strong in Japan and other countries in the far-east, Honda hasn't offered the Super Cub for sale in the USA since 1983. That's about to change, sort-of. San Yang Motorcycle of Taiwan is about to re-introduce the Super Cub to the American market this spring. The Symba is an updated rendition of the classic step-through Cub design, developed by San Yang over the 40 years they made the Super Cub in Taiwan under license from Honda. 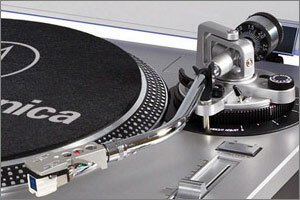 Now that the company has gone independent, it is trying hard to develop its own brand presence in the world. In recent years it has signed up Carter Brothers as its distributor in the USA, and has introduced its popular line of scooters though a growing network of San Yang dealers across the country. This year, encouraged by strong scooter sales and by the enthusiasm of its USA dealers regarding the potential popularity of the Super Cub design among American scooter and small-displacement motorcycle enthusiasts, San Yang began laying the groundwork for a Symba introduction to the American market. They Symba features a 100cc 4-stroke engine paired with a 4-speed manual transmission with the classic Cub-style foot-actuated clutch/shifter mechanism (sometimes referred to as a 'semi-auto' transmission)." The Symba hits the market this spring, priced at $2,598. For more details and photos, visit Team Symba and the official USA site. The CJ 750 sidecar motorcycle is based upon the 1938 BMW R-71. These vintage Chang Jiang military bikes are restored by the 30 person Yiqi Motorcycle Company at a 3000 square foot factory in Beijing. The company also runs the CJ Sidecar showroom in Shanghai. 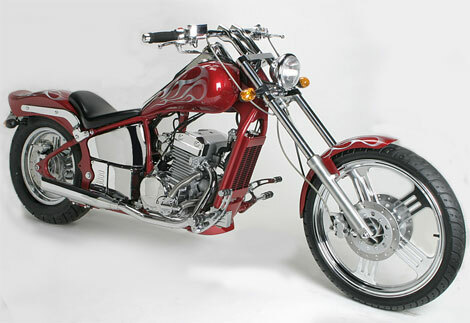 They offer versions with left or right-hand sidecars, and even a solo model. Custom paintwork is available in a variety of styles, although WWII military recreations are their biggest sellers. The company site mysteriously states,"Though the Shanghai Government has stopped to register the license of CJ Sidecar Motorcycles, we can get authentic license of other provinces of China. So foreigner customers can ride their motorcycles in Shanghai with our license. We provide a written contract with our customers when they come and pick up their bikes that guarantees the bike we sell to the customer has a real legal motorcycle plate, and the customer can use it in shanghai. If because of the plate, the customer got fined by the policemen or something like this, then our company will take full responsibility. The reason why we sign a contract with our customers is because many foreigner who bought some illegal bikes in Shanghai from some small companies. The policemen caught them, and kept their bikes, or fined a lot. Some customers do not even dare to drive their bikes on the street." Sounds like there are some interesting stories to be told. One thing's for sure, I probably wouldn't be willing to risk my life on one of these old army workhorses - even after restoration. The Gzhel is a unique Russian-made Ural Tourist motorcycle hand painted in traditional 14th century pottery style by Svetlana Zyryanova. By day, Svetlana toils in the factory's paint department where she's often responsible for less awe-inspiring camouflage patterns. However, she's spends her spare time as an artist. This obsession led her to spend hundreds of hours hand painting a special Ural Tourist in the traditional Gzhel folk art style. This meticulously decorated machine is roadworthy, too; the body is clear coated for protection from rocks and stray bullets. Ural's Madina Merzhoyeva tells us that, "Since 2005 a lot of changes have been made to bring the quality and functionality of a Ural up to the modern standard, while keeping untouched (almost) its retro look." 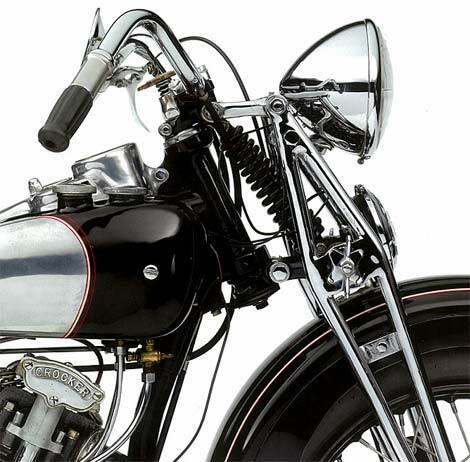 Even back in the late 1930s, BMW made great motorcycles. In fact, they were decidedly better than those the Soviets had to suffer with. In a moment of strategic stupidity, the Germans gave blueprints and casting molds for BMW's out-dated R71 motorcycle to the Russians. Over the course of WWII, thousands of these bikes were manufactured for the Red Army. 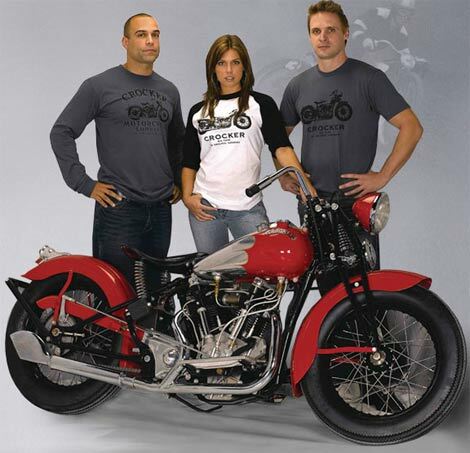 By the 1950s, the Irbit Motorcycle Works was producing Ural motorbikes for civilian use. They survived the breakup of the Soviet Union, and now operate as a privately held company. You can buy one new in North America or Europe quite easily for around $10,000. As for the Gzhel, this one of a kind machine will be auctioned on eBay, starting at noon on April 3, 2009. The motorcycle will be delivered to the dealership closest to the winning bidder, who will also receive a bottle of Gzhel vodka with at least some of the contents remaining. A portion of the sale proceeds will be donated to the Irbit Children's School of the Arts. OK, time to come clean. There's nothing old about a Ridley Motorbike except the styling. 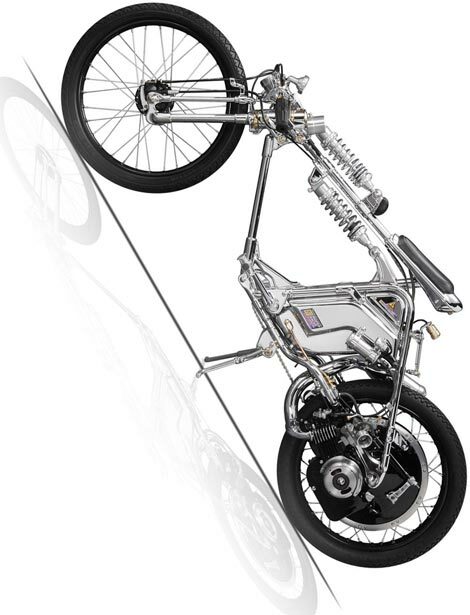 These brand new designs feature modern aluminum frames and 48cc to 70cc motors to propel you in style. Take care not to spook passing horses or lose control on slick cobblestone roadways while dashing around town at speeds approaching a breathtaking 33 mph. It's almost enough to make you believe these fanciful self-propelled contraptions will one day supplant the horse and buggy. Ridley bikes are shipped as kits requiring separate motor installation (presumably for liability reasons). Each of the company's five distinctive designs includes a Cruiselite aluminum monocoque frame with integrated fuel tank, Quick Brick whitewall tires, single speed Shimano coaster brake hub, wiring and rubber engine mount. The frame alone costs a steep $1940, plus an additional $559 for a 48cc 2-stroke engine. Fifty years ago, American manufacturers like Whizzer produced thousands of quirky motorized bicycles. 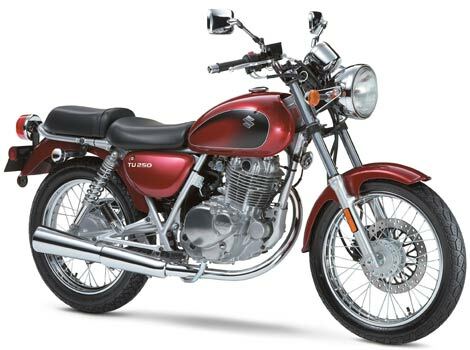 Similar motor bikes are returning to the road, driven by the ailing economy and a healthy dose of nostalgia. The most affordable way to get your hands on one is to modify an existing bike. Zoom Bicycles offers a range of bolt-on 49cc and 80cc 2-stroke motors. You can expect maximum speeds between 30 km/h and 50 km/h, depending on the engine displacement and overall weight. Fuel economy is up to 150 mpg, although these little motors demand 89 Octane fuel premixed with 2-stroke synthetic motorcycle oil. This motorcycular work of art started life as a frumpy little 1966 Honda moped. The 1.5 HP motor and transmission did, anyway. Everything else came from the chrome-plated imagination of designer Chicara Nagata. This machine and others like it will be featured in Chicara Liquid Chrome at ippodo gallery (NYC) from November 7 through January 31, 2009. Follow the link for more electroplated awesomeness. 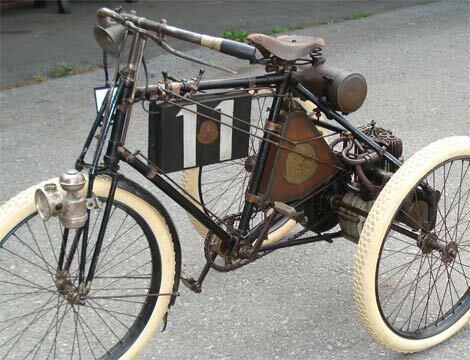 Check out this page of stunning vintage motorcycles photographed at the Antique Motorcycle Club of America's Rhinebeck, NY Vintage Motorcycle Swap Meet. Photographer Brian Lawrence also happens to be the president of the Rocky Mountain Section of the Canadian Vintage Motorcycle Group. For those interested in getting up close and personal with classic and vintage motorbikes, the CVMG will host their annual swap meet at the Millarville Racetrack just south of Calgary this Sunday September 7, 2008. The Johnny Pag Spyder 300 retails for a mere $4099 ($4999 in Canada). It's the brainchild of California custom bike designer Johnny Pag, who has been crafting expensive one-off bikes for celebrities since the early 1970s. Johnny Pag spent many months over the course of several years in China, overseeing the development and production of this amazingly affordable head-turner. His son JR traveled alongside him to China and oversees sales operations in North America. The 8 foot long Spyder 300 is guaranteed to attract attention wherever it goes. It's powered by a liquid cooled 300cc parallel twin based upon the classic Yamaha Virago 250 design. Don't let the small displacement fool you, this bike is capable of cruising comfortably at 120 km/h (75 mph) and gets 60 mpg. The 5-speed transmission drives a 16" x 4.5" chrome alloy wheel on the back, and the entire package weighs in at 360 lbs. The front forks have a 42 degree rake which will feel a bit wobbly at low speeds until you get used to it. Riders report that things smooth out at cruising speeds. It's available in five paint schemes - my favorite is basic black. All in all, the Spyder 300 looks like an interesting low-cost bike for casual weekend riders. 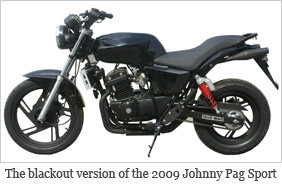 For those looking for something slightly more modern, the company plans to introduce the Johnny Pag Sport in 2009, likely with the same 300cc engine.